FRESNO, Calif. - As part of Minor League Baseball's "Copa de la Diversión" (Fun Cup! 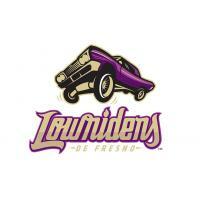 ), a new-for-2019 alter ego, the "Fresno Lowriders" (Lowriders de Fresno) has been unveiled by the Fresno Grizzlies as part of the nationwide MiLB promotion. 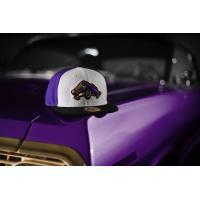 Clad in an eye-catching purple, black and gold color scheme (images attached), the Lowriders will take the field four times at Chukchansi Park in 2019 on June 15-16 (vs. Omaha) and July 27-28 (vs. Reno), in a pair of "Lowriders Weekends" in Downtown Fresno, presented by Tecate. Copa de la Diversión is Minor League Baseball's mission to authentically connect teams with their diverse communities, and embrace/celebrate culture that resonates with Latino fans nationwide. Fresno is one of over 70 communities and teams taking part in the celebration, an initiative separate from the franchise's popular and far-reaching "Fresno Tacos" promotion for home "Taco Tuesday" games. The Triple-A Pacific Coast League has also been at the forefront of "Copa," fielding popular alternate identities such as the "Flying Chanclas" (San Antonio Missions), "Dorados" (Sacramento River Cats) and "Mariachis de Nuevo Mexico" (Albuquerque Isotopes), in addition to the Fresno Lowriders. In addition to the amazing new uniforms on the field, car shows at Chukchansi Park are being planned for both Lowriders Weekends on June 15-16, and July 27-28. It's been announced that the "best in show" will win the "Sonny Madrid Award," named for the Central Valley native and founder of Lowrider Magazine. "This is another landmark day for this franchise, and what it means to have a Triple-A baseball team for our entire community to call their own," said Fresno Grizzlies events and entertainment manager Ray Ortiz. "It's truly an honor to be asked to participate in Copa de la Diversión, and living where we do, we appreciate Minor League Baseball's efforts to celebrate the diversity that exists in their markets coast-to-coast, and doing that in a fun way. 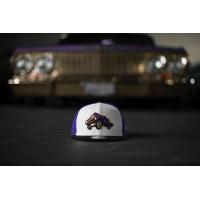 This Lowriders cap might be the coolest uniform piece I've ever seen on a professional field." Several local and state-wide car clubs, including the Lowrider Councils of San Jose and San Francisco, and Travel Team of California are working together to establish the United Lowrider Council of Central California. The council will raise awareness of Lowrider car shows and "cruises" as fun, family-friendly events. Such collaborations exist throughout California in places with vibrant Lowrider scenes, where passion for these collectable cars runs deep. Each Lowriders Weekend will feature music, show cars at Chukchansi Park and Spanish public address announcing throughout each game. The logos, uniforms and merchandise were designed by Fresno Grizzlies graphic designer Dorian Castro, a Central California native (Huron), lending a definitive local flair and expertise to Fresno's entry into Copa de la Diversión. The Fresno Grizzlies are using their platform to promote and advance the positives associated with the word "Lowrider." Too often in pop culture, Lowriders are incorrectly stereotyped as being affiliated with gangs, when actually, maintaining a lowrider car requires knowledge, hard work and dedication. The vehicles are moving pieces of art; many are decorated with imagery that tells stories of Mexican and Chicano history. As a part of Copa de la Diversión, the "Lowriders De Fresno" aim to help change any negative images of lowriding, by shining a light on the positivity of the art form, but also honor a community that is deeply rooted in Central California culture. The game-worn jerseys, autographed by the players, will be available for bid in an online auction beginning July 27, during the second Lowriders Weekend. The Lupus Foundation of America is a nationwide partner of Minor League Baseball for Copa de la Diversión.